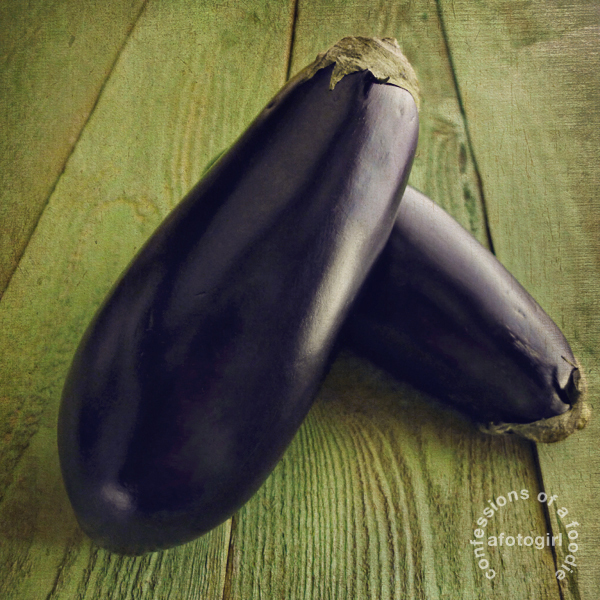 When shopping for eggplant, you want an evenly dark, almost black, purple with taught shiny skin. For this dish, choose eggplant that is long and uniform in shape. No "pear" shaped bulbous eggplants better suited for stuffing because you want your slices to be as evenly sized as possible. I wake in the usual way: Starbuck licking my hand or my arm to get a reaction from me. If I ignore her, regardless if I am on my side or on my back, she will climb on top of me making her way to my face so she can lick it. 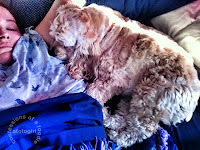 Sometimes, I wake to her paws pushing against the small of my back as she stretches her sleepy muscles. Once Starbuck gets my attention, I reluctantly rise from the warmth and comfort of our bed and open our bedroom door. Sensing success, Star jumps off the bed and bounds down the stairs into the kitchen where she is usually greeted by a propped open back door courtesy of Grandma. I climb back into bed as I listen to her exploring the garden below my window. A few minutes later, the singsong sound of my grandmother’s voice filters up to my room – the same singsong voice she used to use with us girls when we were little. “No me comas! No me comas!” Don’t eat me! Don’t eat me! She tells Starbuck in Spanish as she playfully tries to get Star to shake her hand and say good morning. She’s determined to make Starbuck bilingual. Where I wake up now is a big change from last year. In November, Starbuck and I moved into my grandmother’s house, occupying what used to be my Auntie Sally’s bedroom. It was a decision made at the height of emotion the day my aunt died. Once I had time to grieve and thought about the decision, I feared what the change would bring. I had lived alone for so long that even when I rescued Starbuck it was hard those first few weeks having to share my space with another being. I felt resentful that much of my creative time was taken up teaching and caring for this energetic pup that wasn’t house trained. Of course within weeks I’d completely bonded with this creature and before I knew it, I couldn’t imagine my life without my little fur child. This time, however, I’d be moving into someone else’s home for only the second time in my life sharing that space with my Auntie Syl and my grandmother. So many questions swirled in my head: Was I up for the change? What would it do to my relationship with Starbuck? Would I have to constantly worry about Starbuck getting into and possibly destroying my aunt’s or grandmother’s furniture and possessions? Would my grandmother, who was never a pet person, ever get used to having my dog under foot? Would I eventually feel like it was home or would I always feel like a guest? Would I have enough space and time to nurture that part of me that needs quiet to be creative? Even with all the questions, the potential for a better life in the long run outweighed my hesitation. Sharing a home would be a huge financial burden lifted and it would allow me breathing space to pay down debt. Being debt-free would mean the freedom to follow any path that life presents me. That was a really attractive alternative to the stress of running a household alone. More over, living with family meant it wouldn’t be just me and Starbuck against the world. And it would mean having time to get to know my grandmother better as an adult and more time spent with my Aunt. That sounded really good to me, too. I smile to myself as I realize most of my worries were unfounded: products of the fear of change and the unknown. It seems silly now. Pre-Starbuck, I used to think people were nuts when they said this about their animals: Starbuck is like my child. When she’s happy and fulfilled, I feel joy. She has my grandmother to keep her company while I’m at work and a constant playmate in my Auntie Syl who spoils her with love, toys and attention in the evenings. I’m still her mommy and she acknowledges it all the time by seeking my approval but now her life has grown because her world has expanded. I can see it in her behavior: She is all the better for this change in our lives. And that fills my heart with happiness. Several months back, my Auntie Syl told me that my grandmother had mentioned wanting me to teach her how to cook eggplant. Grams is 83 years young. She is essentially a self-taught cook with her expertise being in Mexican cuisine. She tried making the dish herself but said that it didn’t look or taste anything like what she had at the restaurant. Apparently, one of her favorite dishes to order at Italian restaurants is eggplant parmigiana. So I had her over just before I started packing for the move to teach her my super simple eggplant parmesan recipe. She commented as she watched me in the kitchen that she didn’t know about salting eggplant to help draw out it’s moisture or that the biggest step she left out in her attempt was breading and frying the eggplant slices before layering them with the cheese and sauce. She loved the finished dish and I enjoyed teaching her something since she has spent time teaching me some of her recipes. A couple of Mondays ago, I made the dish on a last minute whim as a side dish to the ribeyes I was making us for dinner. Her enjoyment then reminded me that I had yet to post it here so last Monday, I made it again. It was gone in no time. Most of the recipes I found years ago when I was looking to learn this dish called for 2 or 3 large eggplants. Unless you’re having a dinner party or want to be eating this dish for days, I find that my version is much better suited for a midweek dinner for two (HEALTHY portions) or 4 (healthier portions paired with a big green salad). 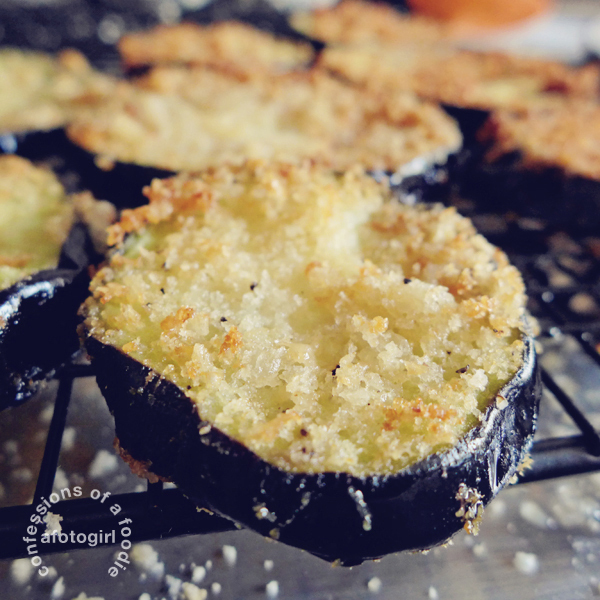 You can lighten this up by skipping the shallow pan frying and instead, spraying the breaded eggplant slices with a little olive oil then placing them on a wire rack on a rimmed baking sheet and baking it in a 375 degrees pre-heated oven. After 15 minutes, remove the pan, flip the slices, spray a little olive oil on this second side and return to oven for another 10 to 15 minutes or until golden. 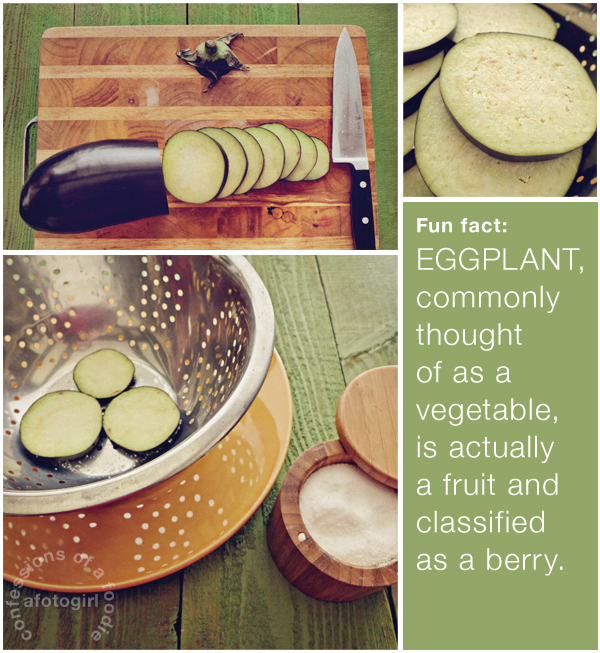 Salting the eggplant to remove excess water: Place a single layer of the sliced eggplant in a colander. Liberally sprinkle with kosher salt. Continue layering and salting until all eggplant has been salted. Place a plate on top of the colander small enough to fit within the colander so that it makes contact with the eggplant. Weight it down (I place my heaviest mixing bowl filled with couple cans of food on the plate) and set aside for at least 20 minutes with a plate under the colander to catch the liquid. Prepare the sauce: Place the diced tomatoes and sauce into a bowl. 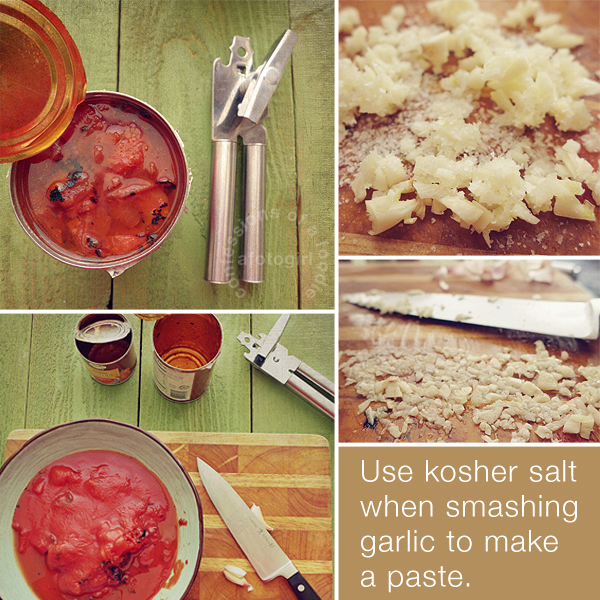 Add the minced garlic, thyme, 1/2 teaspoon kosher salt and freshly ground black pepper to taste. Put the oregano between the palms of your hands and rub them together over the bowl to crush the leaves and release the essential oils of the oregano. Stir well. Adjust salt and pepper to taste. Set up your dredging station: Place the eggs into a small shallow bowl and beat until scrambled well. Set aside. 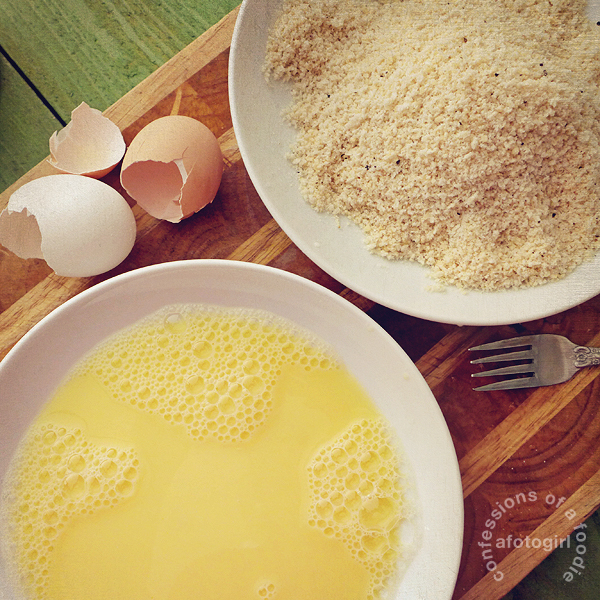 Place the bread crumbs and 2/3 cups of parmesan into a second small shallow bowl. Add about a teaspoon freshly ground black pepper. Stir to mix well. Set aside. Place a wire rack (I use my cookie cooling racks) onto a large rimmed baking sheet. Using paper towels, wipe off the salt from the eggplant slices and return them to the colander when they are all cleaned (some recipes say to rinse the salt off but we don’t want to add back the water that we just drained out of the eggplant!). Using the wet hand, dry hand method, take a slice of eggplant and quickly dip it into the egg then carefully drop it into the bowl of bread crumbs/cheese. Using your dry hand, cover the eggplant with the mixture. Flip and coat all sides. Place dredged eggplant onto the wire rack and continue with the rest of the eggplant. There should be about 1/4 cup of crumbs left over when you are done. We’ll use this to top the eggplant before baking. Heat a large skillet over medium high heat. Add the olive oil to the pan. Once it’s shimmering, working in batches, place four slices of eggplant into the hot oil. You don’t want to overcrowd the pan or it will bring down the oil temperature. Cook until golden, about three to four minutes then carefully turn over and cook for another three to four minutes or until golden. Remove and return to wire rack to drain. Chiffonade the basil: Make small stacks of the basil leaves. 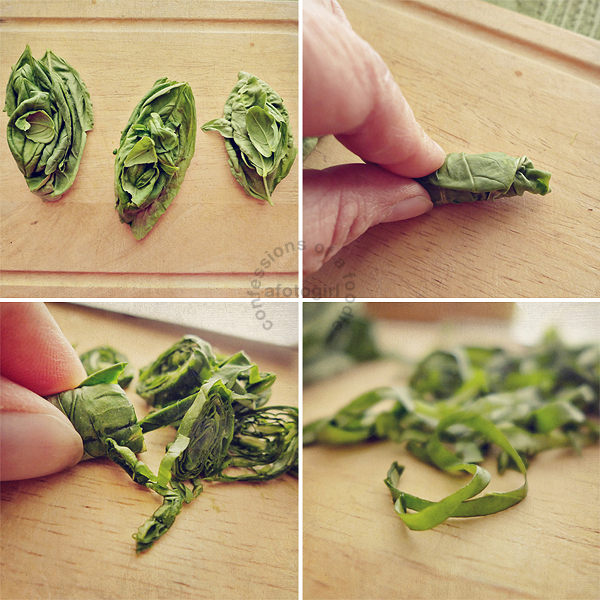 Roll the stacks tightly and thinly slice creating ribbons of basil. This is called chiffonade. Continue until all basil is cut. Separate the ribbons and set aside. Place a few tablespoons of tomato sauce into a small casserole dish. 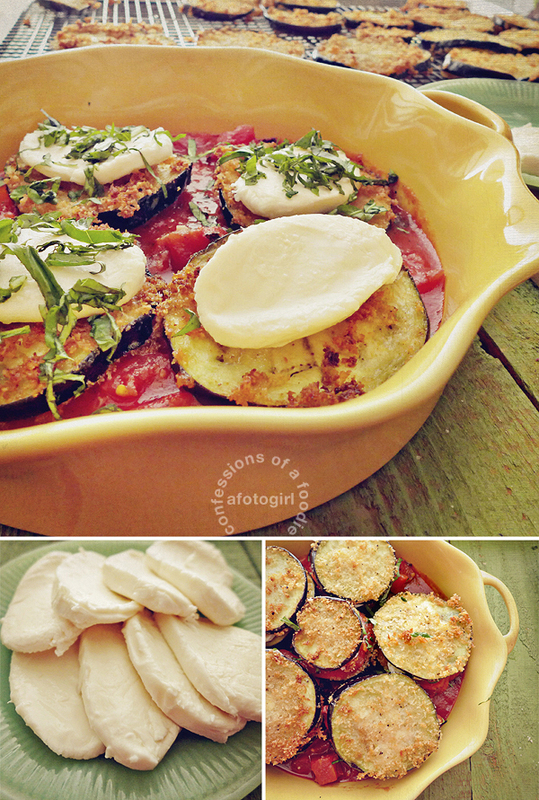 Create a single layer of the largest slices of eggplant on top of the sauce. Top each slice with a medallion of mozzarella and some basil. 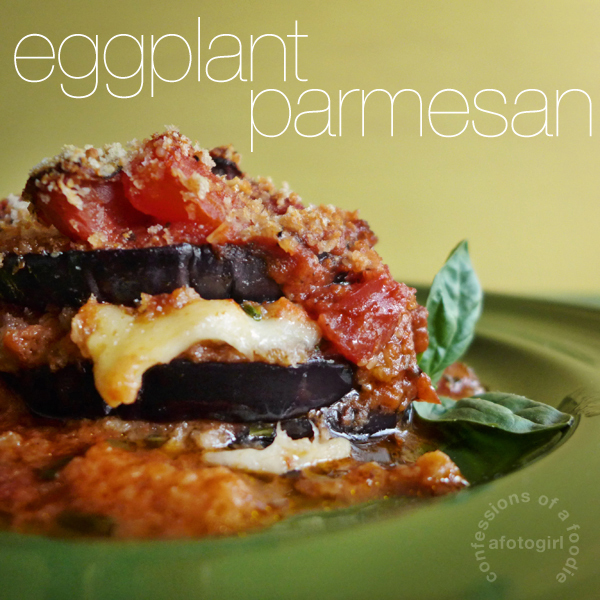 Top each stack with another slice of eggplant then top each stack with a tablespoon of sauce. Repeat the layering finishing with pouring the remainder of the sauce over all the stacks. 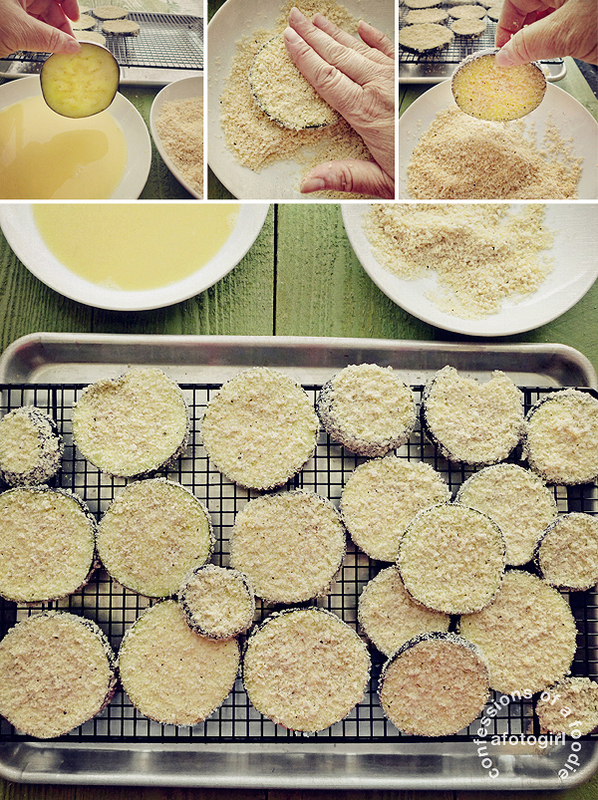 Add the last 1/3 cup of parmesan into the leftover breadcrumbs and sprinkle the mixture over the top of the eggplant. Bake uncovered for 35 minutes or until the parmesan is golden. *Don't worry about having leftovers of fresh mozzarella. It's so delicious chopped and put in a salad or makes a yummy omelet that the leftover will be gone in no time. Love eggplant? 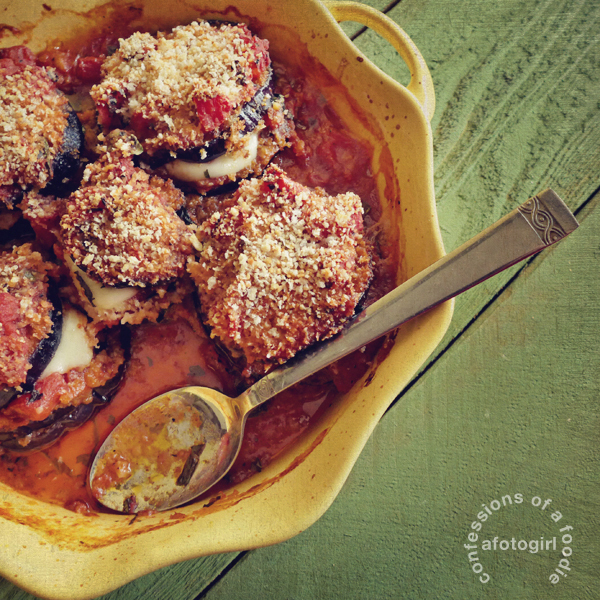 Try my Imbotitti (stuffed eggplant) recipe. 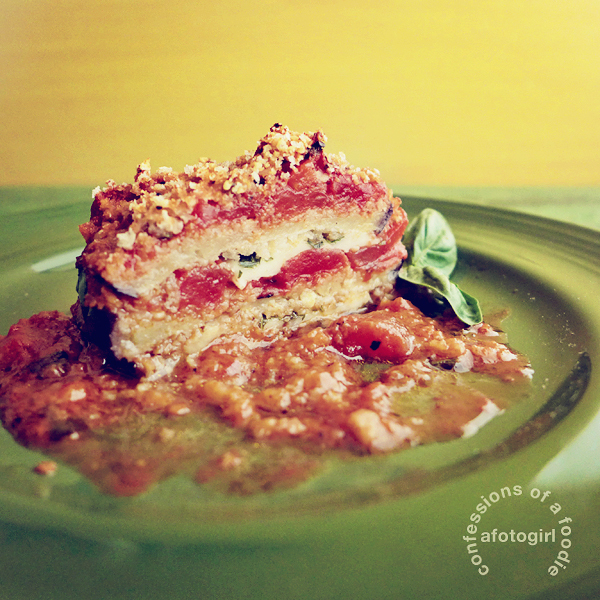 It's another yummy idea for Meatless Mondays. Your turn: How do you deal with change? Do you embrace it or run the other way? A quick note on the images: Just getting my creative mojo back, I decided to challenge myself and test out my new Leica for easy, low fuss food photography. I love my Canon 5D but the ease of use and the quality I get from the D-Lux 6 paired with scrimmed window light made this a more organic shoot. Will definitely be using it again for food blogging when I don't feel like handling my big heavy Canon. I made this last night an it was a big hit. I used the oven method in order to use less oil. 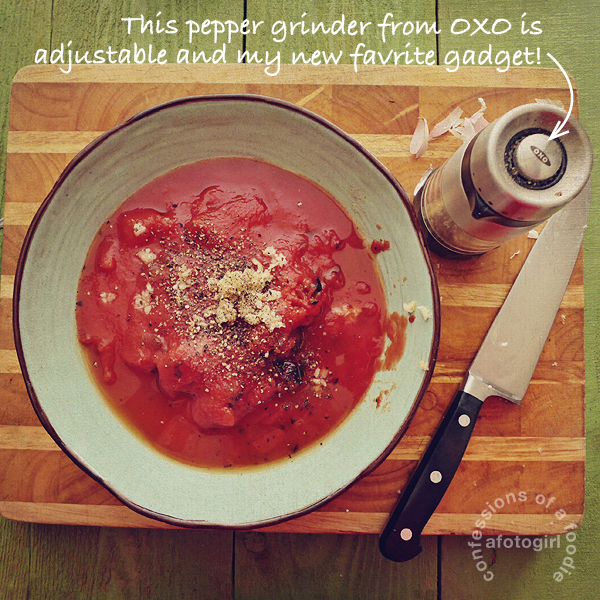 I also added a little sprinkle of crushed red pepper flakes to the tomato sauce mixture to give it a bit of a kick. This recipe is a keeper!! YUM!! I want to make this for a dinner party, for 9 ppl. Can you make ahead - the day before or in the morning? Hi there. I haven't but I don't see why not. Do everything except topping with the breadcrumb cheese mixture then refrigerate. About 45 minutes before your guests arrive, pull it out of fridge and let it rest on the counter for 10 minutes to take some of the chill off. Then top with breadcrumb mixture and bake off.